These accounts are written by 19th century naturalists, scientists, veterinarians, sportsmen and dog fanciers who are describing the working gripping dogs of their day. There is a link to the original text for each of these accounts where much more information can be found about the size, breeding and history of the gripping dogs which gave rise to the pit bulldog of today. Please note how these characterizations largely agree with each other and agree with views of pit bulls today. This is because the ferociousness, stupidity, dangerousness and aggressiveness seen in pit bulls today was passed on from their ancestors through genetics. Is the fiercest of all the Dog kind, and is probably the most courageous creature in the world. It is low in stature, but very strong and muscular. Its nose is short; and the under jaw projects beyond the upper, which gives it a fierce and unpleasing aspect. Its courage in attacking the Bull is well known: its fury in seizing, and its invincible obstinacy in maintaining its hold, are truly astonishing. It always aims at the front; and generally fastens upon the lip, the tongue, the eye, or some part of the face; where it hangs, in spite of every effort of the Bull to disengage himself. The uncommon ardour of these Dogs in fighting will be best illustrated by the following fact, related by an eye-witness; which at the same time corroborates, in some degree, that wonderful account of the Dogs of Epirus, given by Elian, and quoted by Dr Goldsmith in the history of the Dog; – Some years ago, at a bullbaiting in the North of England, when that barbarous custom was very common, a young man, confident of the courage of his Dog, laid some trifling wager, that he would, at separate times, cut off all the four feet of his Dog; and that, after every amputation, it would attack the Bull. The cruel experiment was tried, and the Dog continued to seize the Bull as eagerly as if he had been perfectly whole. Of late years this inhuman custom of baiting the Bull has been almost entirely laid aside in the North of England; and consequently there are now few of this kind of Dogs to be seen. As the Bull-Dog always makes his attack without barking, it is very dangerous to approach him alone, without greatest precaution. The Bulldog is remarkable for the undaunted and savage pertinacity with which he will provoke and continue a combat with other animals, and when once he has fixed his bite, it is not without extreme difficulty that he can be disengaged from his antagonist. He is oftentimes fierce and cruel, and seems to possess very little of the generosity and disposition so remarkable and so celebrated in dog species. He frequently makes his attack without giving the least previous warning, and often without that discrimination of persons or animals which we observe in most other dogs. The bull-dog, as well as the mastiff, is almost peculiar to england; and the breed seems to have been chiefly encouraged for the baiting of bulls. This ferocious practice, thanks to the increasing humanity and civilization of the people, is, however, now on the decline; and consequently, bull-dogs are at present much less numerous than they were formerly. Rural Sports by Delabere P. Blaine, esq. The bull-dog (C. Molossus Linn.) Before we enter on any further description of this dog, we must premise, as regards the pictured representation of it, that although sufficiently characteristic, and therefore likely to please some of our readers, yet it was not designed by ourselves, but in our absence was drawn and engraved as here seen. Pendent, either from the nose or lip of the bull, this ferocious dog cannot be said to be either out of character or out of place..."
"The bull-dog is possessed of less sagacity and less attachment than any of the hound tribe; he is therefore less favoured, and more rarely bred with care, excepting by professed amateurs of sports and feelings little creditable to humanity." "…never letting go the hold they have, even if mutilated, as if there was some spasm in the jaws to prevent their unlocking. The bull-dog differs from all others, even from the mastiff, in giving no warning of his attack by barking; he grapples his opponent without in the least estimating their comparative weight or powers. 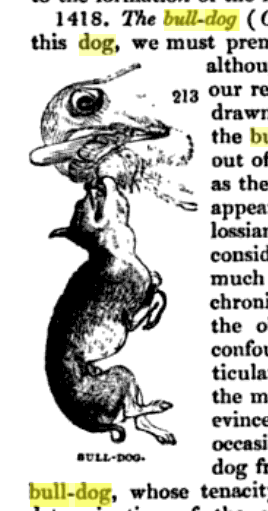 We have seen one pinning an American Bison and holding his nose down…"
"As the bull-dog differs in appearance from all other dogs, so his temper and disposition seem equally removed from the general standard." "It is very well known that the bull-dog is capable of maintaining his hold with incredible perseverance; this, of course, arises, in great degree, from his courage…"
"…the breed of bull-dogs is not so numerous, not yet so nicely attended to, as formerly, and perhaps, at no distant period, will be altogether extinct - "a consummation devoutly to be wished;" as they are calculated for no one useful purpose." "…when they make an attack, it is in silence; and were they to seize an innocent person, or a child, the most disastrous consequences, or death itself, might result: supposing the victim to be disabled from screaming the mischief would proceed in silence, and the catastrophe take place without any person being aware of the circumstance." "The want of that degree of discernment which is found in so many of the canine varieties, added to the ferocity of the bull-dog, make it extremely dangerous when its courage and strength are employed to protect the person or property of its owner, or for any domestic purpose since, unlike many of the more sagacious, though less powerful dogs, which seem rather more anxious to give the alarm when danger threatens, by their barking, than to proceed immediately to action, the bull-dog, in general, makes a silent but furious attack, and the persisting powers of its teeth and jaws enable it to keep its hold against any but the greatest efforts, so that the utmost mischief is likely to ensue, as well to the innocent visitor of its domicile, as to the felonious intruder. …The cerebral capacity of the bull-dog is sensibly smaller than in any other race, and it is, doubtless, to the decrease of the encephalon that we must attribute its inferiority to all others in every thing relating to intelligence. The bull-dog is scarcely capable of any education, and is fitted for nothing but combat and ferocity…"
New American Cyclopedia, vol IV, G. Ripley and C.A. Dana, ed. 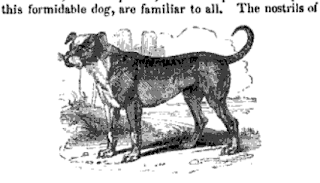 "An able recent writer on the dog considers the bull-dog as a sort of abnormal canine monster, a dog idiot, yielding to uncontrollable physical impulses, now of blind ferocity, now of equally blind and undiscriminating maudlin tenderness which renders him more addicted to licking, slobbering, and mumbling the hand, the boot, or any other part of any person to whom he takes a sudden and causeless liking, and who he is just as likely to assault the next moment, than any other of his species." Shared with special thanks to the several authors at Craven Desires and America's Dog blogs for finding most of these early accounts.